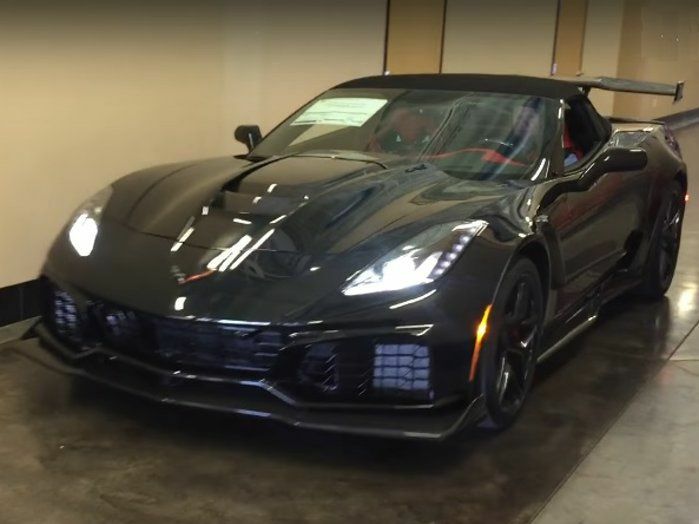 Production of the 2019 Chevrolet Corvette ZR1 began earlier this month and with Rick Hendrick having paid nearly a million dollars for the rights to the first example of the 755 horsepower supercar, C7 ZR1 #0001 was built to the desired specifications of the legendary NASCAR team owner. In other words, Hendrick basically picked every option that he could, getting the most for his money and creating one of the most heavily-appointed C7 Corvette ZR1s possible. After Hendrick’s 2019 Corvette ZR1 rolled off of the assembly line, it was driven through a fairly narrow hallway and out into the open air, where the NASCAR team owner posed for pictures with his 755 horsepower supercar. After the photo-op, Hendrick and some of his crew spent some time making laps around the road course of the National Corvette Museum Motorsports Park, but he did not get to take his Corvette home. Like every new Corvette ZR1, Hendrick’s supercar had to go through a rigorous quality control process that takes roughly two weeks, but with the first batch of LT5-powered Chevy supercars having been shipped, this car might be parked in the garage with the first C7 Stingray and the first C7 Z06 – both of which are also owned by Rick Hendrick.